SQLite is interesting database management system (sounds boring) that usually works behind the curtains as component in various software. For example it is used in Firefox to store bookmarks and other stuff. I had need to do some programming making use of SQLite and drafting database in native command line tool felt clunky. After some time I encountered SQLite Expert Personal which is nice graphical front-end for designing (and more) of SQLite databases. browse data, including filtering and support for images in binary fields. It has excellent interface with large buttons, fonts and fitting use of zebra tables. There is even decent help file on top for which I don’t look often but appreciate when exploring new tech. Considering SQLite Expert has commercial Professional version it was a given that there will be limitations. Some of them are for advanced features but I was unpleasantly surprised to see some functions basic for native utility blocked. I can understand cutting more complex stuff but lack of even basic dump of database into SQL statements is more than annoying. 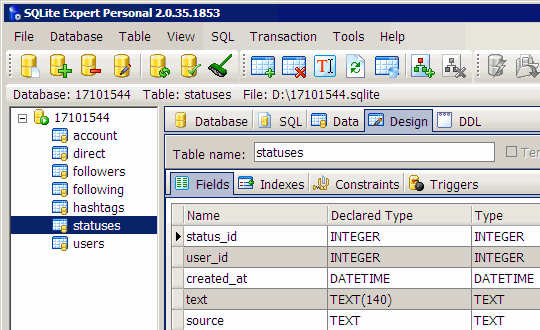 SQLite Expert works great for initial database design. However free version has some serious limitations that may easily be deal killer. It is quite good for a novice (like me) and I am going to stick with it for now. However I am not qualified to make judgment if pro version worth its money. I’ve had a need for some various SQLite tools – mostly with working/manipulating Spiceworks data. I’ve used this tool: http://www.singular.gr/sqlite/ – called ‘Sqlite3Explorer’. Also, on the reporting front, I’ve used ‘SQLDrill’ which is an Excel add-in. This is nice for generating charts, etc. Both of these tools allows for graphical creation of queries. Finally, the SQLite Manager add-on for Firefox is pretty decent too. If I may suggest, after experimenting with a couple of SQLite tools, I am using TKSQLite, which I find very intuitive, easy, lightweight and free. Works for Linux and/or windows. If you need more tools (or want to explore alternatives), you can also go on the SQLite wiki. They have a BIG list of tools you can use, on Linux or Windows. All suggestions are welcome. :) Will check it out. I am not too sure what exactly I need (newbie with SQLite as I wrote). I am picking tools and components to use in graduate project on programming courses. I recommend Firefox Sqlite manager for a lightweight gui. AnySQL Maestro (freeware) is outstanding. It has as many features as the pay-for products – import/export, query builder, database design, etc. It will connect to about any database. You may need to install the Sqlite ODBC driver – sqliteodbc. Thanks for suggestions, bookmarked to check out. I use autoit and sqlite and it works like a charm. You can edit triggers and constraints with SQLite Expert Personal since version 2.1.8. Also, the Personal Edition has some limited import-export capabilities (you can copy tables or records between SQLite databases and/or Excel via clipboard). Thank you for dropping by and clarifying those points! I had updated post accordingly. Do you know on how to connect or use this in visual basic 6.0 as database? Please reply i need some ways on how to use it. By “this” you mean SQLite database? Sorry, no remote idea since I hadn’t ever used Visual Basic.